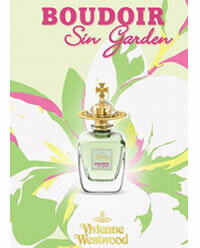 UK Perfume Guide - Vivienne Westwood Sin Garden Soft Floral Perfume for Women. Vivienne Westwood Boudoir Sin Garden perfume is a new perfume for 2007 and is a light floral fragrance that creates a delicate and alluring aura on the skin. Vivienne Westwood Boudoir Sin Garden was created as a playful and seductive journey through a traditional English Garden in the spring and contains all the beautful essences that are associated with these traditional garden flowers. This beautiful new Boudoir Perfume is light and fresh. The top note reveals delicate freesia, spiced with pink pepper and aldehydes for its retro aristocratic air. In the heart, violet melts with powdery heliotrope and orris. The drydown is a sensuous combination of amber, sandalwood, oak moss and musk, for a beautiful and individual aura every time it is worn.